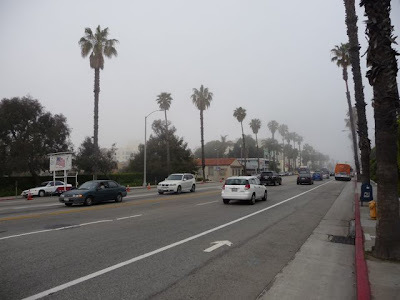 Earlier in May I walked up Pico Blvd about four miles - from the ocean to Westwood Blvd. This is the third installment of a three part series. Here's a link to Part I and Part II. 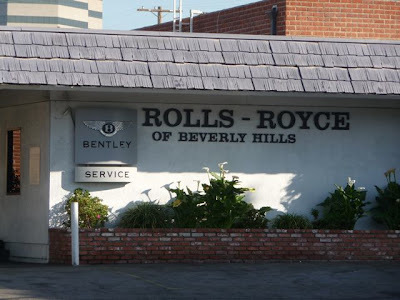 At about 3 miles up, at Pico & Exposition, I came across "Rolls-Royce of Beverly Hills." They apparently also service Bentleys. Wait a minute . . . Beverly Hills is several miles away. There also weren't any Rolls-Royces or Bentleys. In fact, their lot was pretty empty. If I was really looking for a "Beverly Hills" dealership (I'm not) I'd want it to be in Beverly Hills. And I'd want it to have at least a couple of cars they sell or service on the lot. Call me crazy . 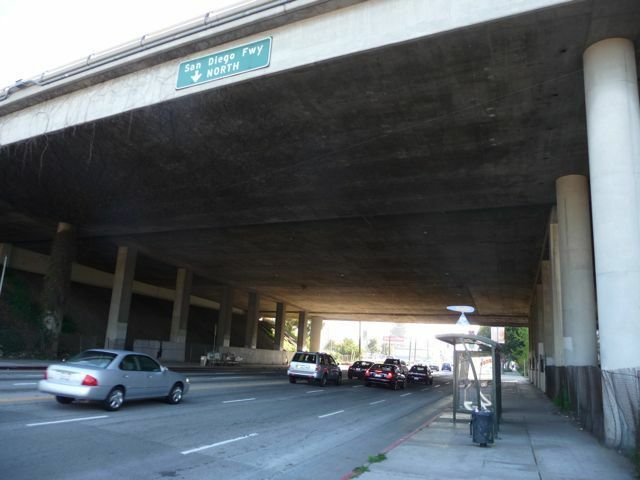 . .
Across the street from Rolls-Royce of Beverly Hills was this less than stellar parkway. Actually, I took a picture of this because this was the only trashy looking area of my entire walk. 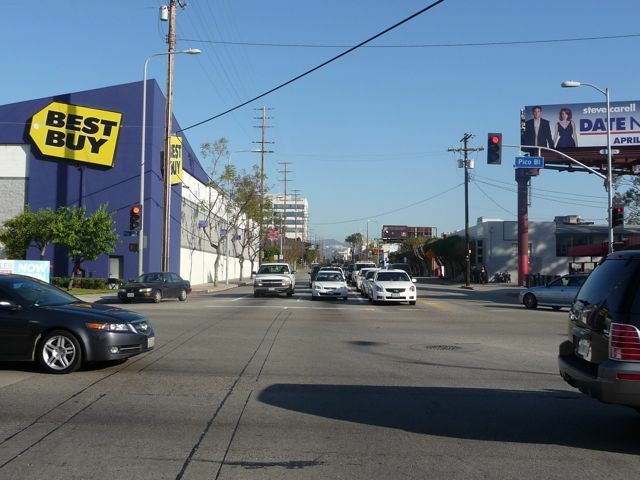 And this being Los Angeles, a palm tree in the photo can even make a dumpy parkway look good - or least better. 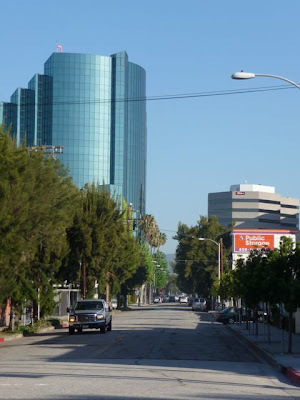 One of the many small office towers along Olympic Blvd, about four blocks away. 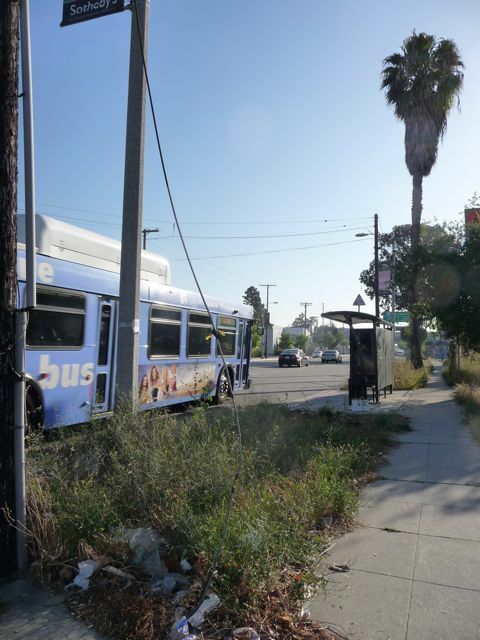 Olympic parallels Pico through much of Los Angeles. 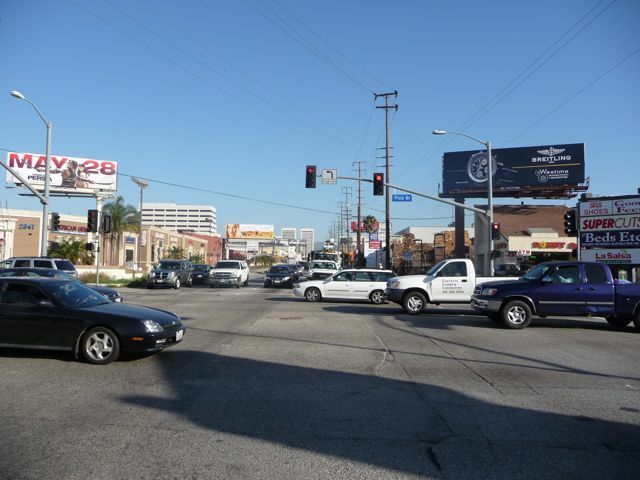 The city has toyed with the idea of turning each of them into one way streets between downtown and Santa Monica - to help with traffic flow. Of course, the local residents are understandably up in arms (I would be too). What in the world? On a relatively large parking lot at Pico & Corinth is "The Jean Repair Shop" - a tiny shack that buys and sells used jeans. A block away at the corner of Pico & Sawtelle is "Big Tomy's" - yet another knock-off of the successful "Tommy's" hamburger chain. I love the original "Tommy's" www.originaltommys.com - to me these knock-offs just clutter the landscape. Pico Blvd passes underneath the massive San Diego Freeway - often referred to by it's number: The 405. The chaos of West L.A. is really apparent here - these few blocks around the 405 were the least pleasant of an otherwise very enjoyable four mile walk. A block south of Sepulveda is Adventure 16. 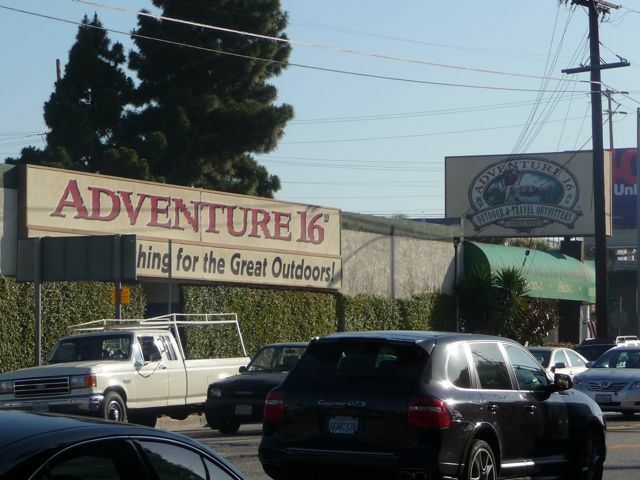 They've been around forever - actually, according to their site www.adventure16.com since 1962. Apparently, they originally had ties with the Explorer Scouts (a branch of the Boy Scouts), so I guessing their name came from gear designed for 16 year old Scouts? Just a guess. Nice store - I've bought maps and guides for local hiking here. The intersection of Pico & Sepulveda. Thanks to the 1947 song by bandleader Freddy Martin, the song "Pico & Sepulveda" made this otherwise non-descript intersection famous. 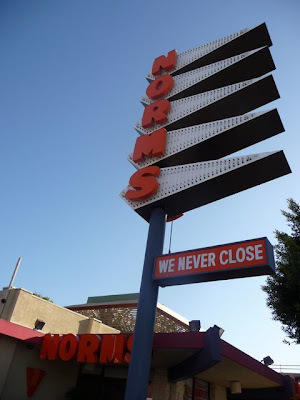 A couple blocks up Pico is Norms Restaurant. I like the mid-century "googie" architecture, but what really caught my eye was . . .
. . . the Rolls-Royce coming out of the parking lot. 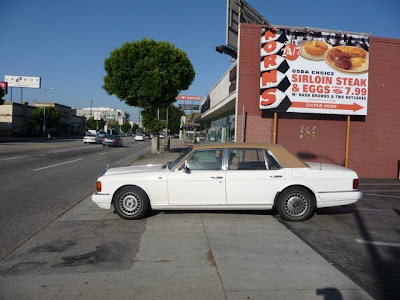 Where else but L.A. would you see a Rolls Royce coming out of Norms? 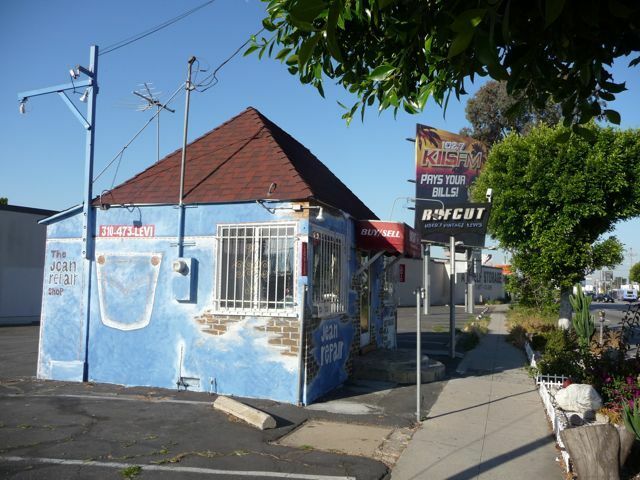 Maybe stopping off for the "$7.99 sirloin steak & eggs special" before heading over to our friends at Rolls-Royce of Beverly Hills - in West L.A.? Walking towards Westwood Blvd, I was impressed by the beautiful tree-lined residential neighborhoods right off Pico Blvd. 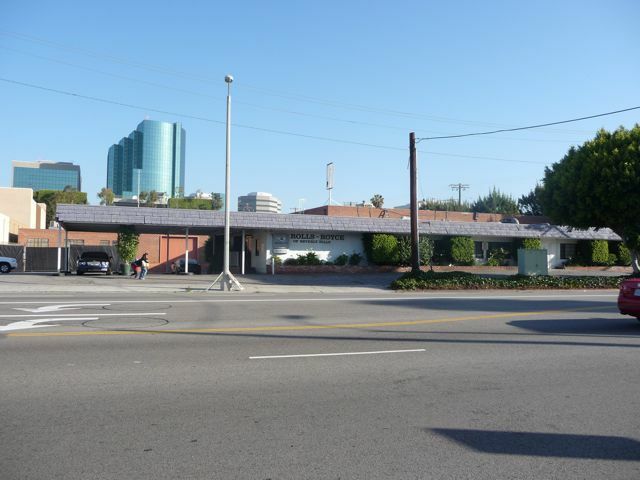 This area is considered the southern most edge of Westwood. 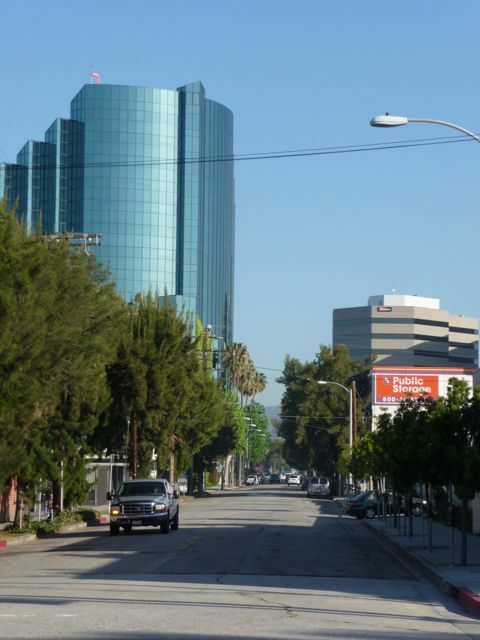 Despite the downturn in the economy, homes in these neighborhoods are not cheap. 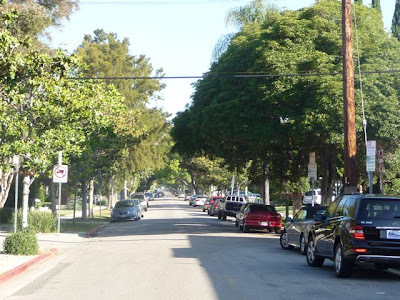 The proximity to the rest of the westside put these single family homes between $750,000 - 1.5 million dollars. 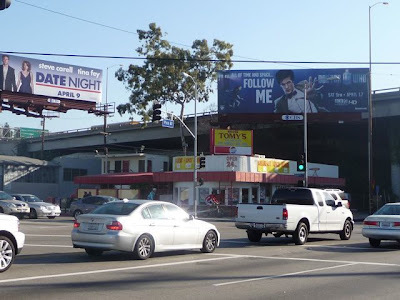 The above photo is of Midvale Avenue, looking north from Pico Blvd. Turning around 180° and looking south across Pico . 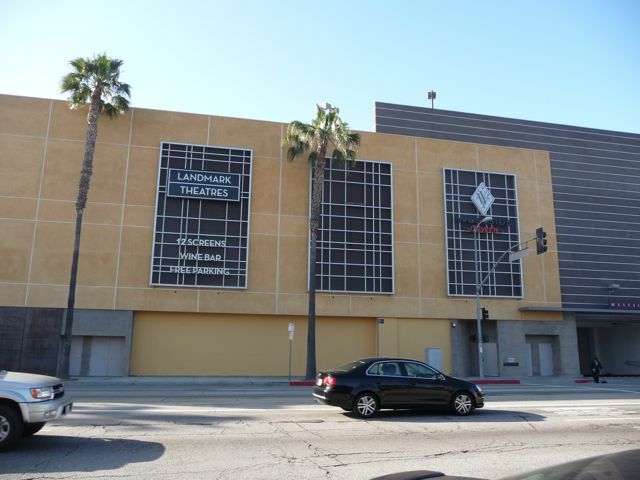 . .
is the Landmark Theaters complex, part of the massive Westside Pavilion shopping center. The contrast between a tree-lined neighborhood in the previous photo and this huge mall at the end of their street was, well, a bit jarring. Continuing on a block to the corner Pico & Westwood Blvd. 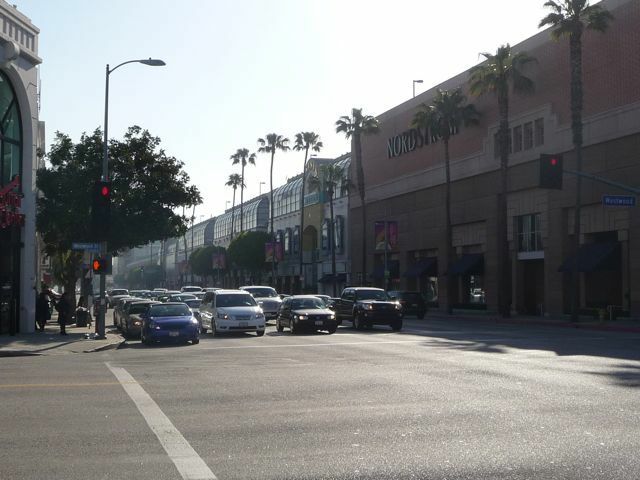 The Westside Pavilion shopping center runs along Pico for five and a half city blocks. It's got the usual assortment of retail chains you've find in your average mall (aka "maul"). What is unique is how the building comes right up against the street. There is a large parking garage (after all, this is Los Angeles) around back. Looked at my watch, er phone. 8:20am. Had to get back to Santa Monica - and my car - by 9am to avoid a ticket. Hopped on this bus here, the Santa Monica Big Blue Bus Number 7 Express. Great choice. 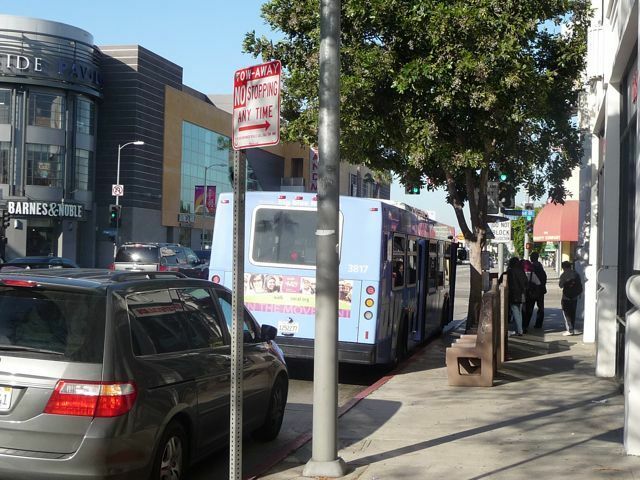 Express = limited stops. It really moved. Made it all the way back down to where I started in about 25 minutes. 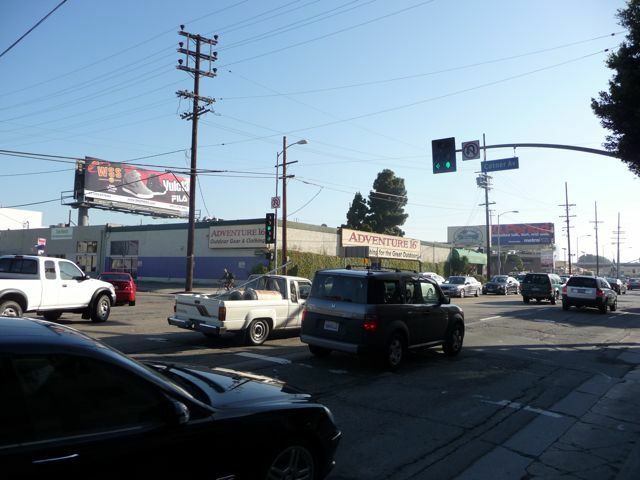 That's my car, the white Honda Accord, across the street on the left of the photo (I've since sold it). Santa Monica still shrouded in cool coastal fog. I ended up doing a similar walk up Pico (and going about twice as far) a week later. I'll save that for another blog post.